Whether financial support will be given to the affected growers has to be further examined. Austrian growers have broad weather insurance, but because of the high premiums not a lot of growers use it. Damages have also been reported from Burgenland, slightly more to the east, where temperatures were recorded at 3 to 4 degrees below freezing. Austria produces about 170 million kilograms of apples annually. Golden Delicious and Gala are the largest strains. In the night from Tuesday to Wednesday, 27 April approximately 10 centimetres of snow fell in south Germany. 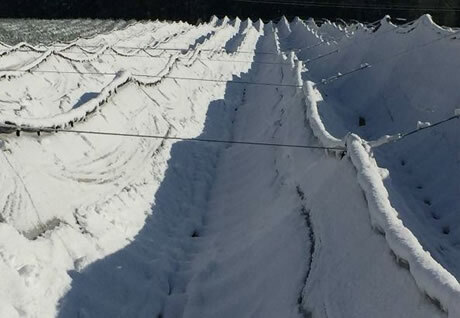 Roofing specialist Voen made photos of cherry plantation under a net, which remained standing safely under a thick layer of snow. Switzerland also shows a very white image. In the region Graubunden in eastern Switzerland, which cultivates a lot of grapes, multiple braziers were used. The region also employed a helicopter to mix the different layers of air. 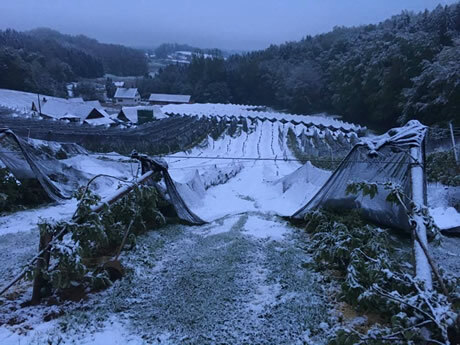 The Italian agricultural organisation Coldiretti also reported that the fruit cultivation suffered damages from the weather circumstances. The increasingly often occurring results of climate change resulted in more than 14 billion Euro of damages to agriculture in the last ten years, according to Coldiretti. Last winter, Italy had the warmest winter in history. This resulted in an early development of crops. In Belgium, as in the Netherlands, it is mostly corn snow that is a nuisance to fruit cultivators. Night frost is not ruled out in Belgium for the coming nights. The NFO also received reports about frost damage from Croatia, particularly from the north on the border with Hungary and Slovenia. The photo below shows a cultivator from the region with brown apple fruits. Slovenia also reports damages. Temperatures, which entered the country from the eastern side, went to 4 degrees below freezing. Most damage is currently with nuts and stonefruits in eastern Slovenia, and are already called catastrophic. Apple and pear cultivation has also been hit. The low-lying areas are frozen over for 60 to 70 per cent; the higher areas less so, with several tens of percentages. Especially temperatures bothered fruit cultivators, and grape cultivators in particular, in France. High atmospheric humidity because of rain and snow in Burgundy (north eastern France) caused many problems for the young vines. This combination means that there are now talks of the sharpest frost since 1981. See the watering photo of the grape field.